If traditional gender roles were clearly separated in bourgeois family life, such distinction also held true for children growing up outside a regular family. 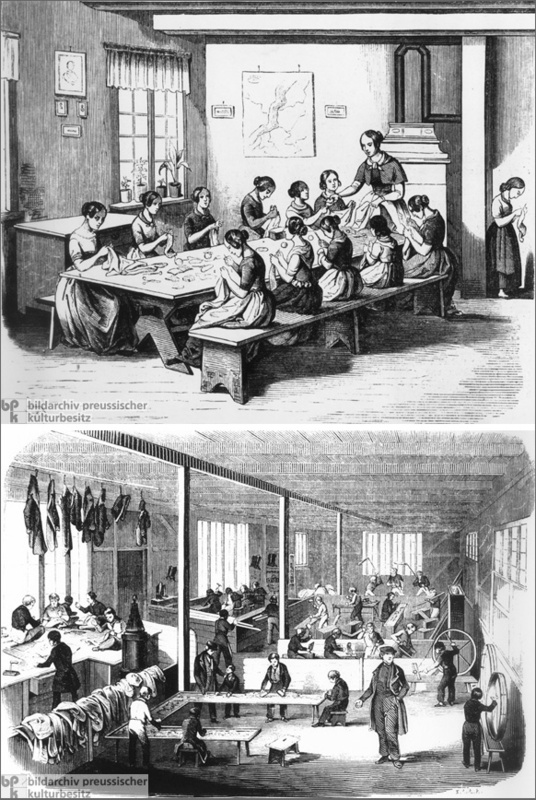 As the two wood engravings from 1846 illustrate, this principle also applied to the “Rauhe Haus,” a home for orphaned and neglected children founded in Hamburg by the Protestant theologian Johann Hinrich Wichern (1808-1881). Whereas the girls do needlework, the boys labor in the workshop. Care and discipline seem to blend here into family-like structures: note the girl in the corner, who is probably knitting as punishment, and the stern yet encouraging supervisory staff.